Learn: Updates are relevant if you share content that actually improves me as a professional. So post something I can learn from. Instead of posting “We have this speaker”, why not share some of the content that the speaker is talking about that I can use instantly? By putting this value upfront, I will like it, share it and want to stay involved. Why take notes on a piece of paper if you can share them with the ICCA member community and allow the world to see? Have a look at the key takeaways shared by 2014 #ICCAWorld Congress participants, grouped by Congress education session: https://storify.com/iccaworld/take-aways-from-the-53rd-iccaworld-congres-in-anta. They read as shared notes from the education sessions. This is one of the main purposes of the ICCA community: Sharing knowledge and expertise, and this is a great way to do it online. Please help us share this useful content, using hashtag #ICCAWorld on Twitter. Connect with the speaker by mentioning his/her Twitter account in your posts. You can find the Twitter accounts of all the speakers in our “RoadtoArgentina Speakers” Twitter list: https://twitter.com/ICCAWorld/lists/roadtoargentina-speakers/members and in their profiles in the Spotme event app. Love: This game is called Social Media, so you should behave socially. Share some love. Thank people. Congratulate people. Share the love! People will like that. Especially if they know these people or it is about themselves. Remember and share the moments with your ICCA Friends at the Congress: Take a picture of yourself with some of your ICCA member friends using hashtag #ICCAFriends. Laugh: Social media is about people, and people like the emotion of laughing. Funny content is very relevant stuff! Location: Where are you? Are you on your way to the ICCA Congress in Buenos Aires? 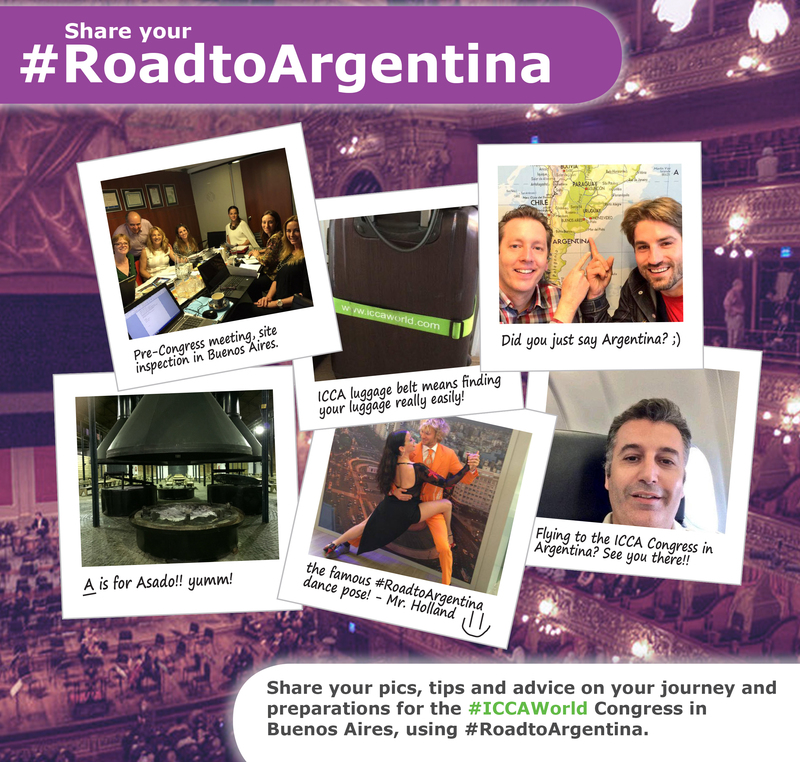 Use hashtag #RoadtoArgentina to share images, tips and advice during your journey and preparations for the #ICCAWorld Congress. Maximise your ROI of the ICCA Congress by downloading the ROI booklet (http://www.iccaworld.com/cdps/cditem.cfm?nid=5096), providing practical advice and check-lists to help each delegate identify and maximize the benefits they gain from attending meetings, congresses and tradeshows. Listen: Search for #ICCAWorld (https://twitter.com/hashtag/ICCAWorld) on Twitter and connect and engage with other ICCA members.